Stunning contemporary cedar vacation home on the Prince Edward Island (PEI) north shore with luxurious accommodations for 4-6 guests and panoramic views of New London Bay and PEI National Park sand dunes. 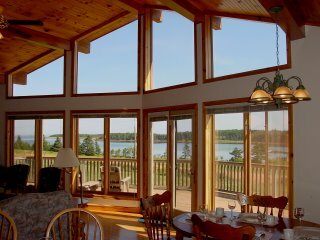 On a private peninsula 5 min from Cavendish, Seascape Chalet is perfect for a romantic retreat, family adventure, golf getaway or fall escape. 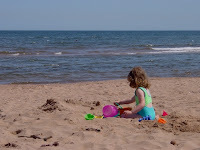 For tranquility in the heart of the PEI North Shore, try Seascape Chalet - a great place to stay! PEAK 2019 WEEKS STILL AVAILABLE! View our rates, availability & reserve your 2019 week today! 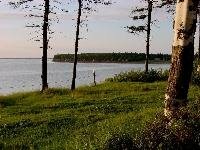 Your retreat in the heart of the Prince Edward Island north shore! 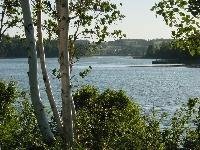 Explore a little further, and a peaceful shoreline, biking trails and abundant space for outdoor activities are all available right outside your door. 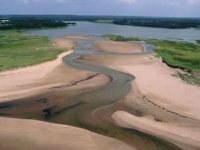 Navigate the shallow waters of the peninsula coastline or venture out to the isolated barrier sand dunes of the PEI National Park sandspit in the two kayaks provided. Take a guided tour of New London Bay on a seadoo or get an aerial perspective of the area from the Island's only parasailing outfitters located only a minute away. 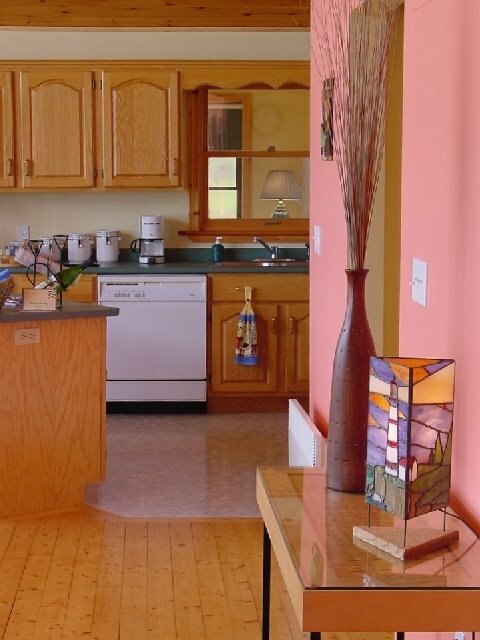 Venture up the Hope or Stanley rivers to try your hand at trout fishing, or join a deep sea fishing excursion on the Gulf of St. Lawrence and then cook up your catch in your fully equipped kitchen. 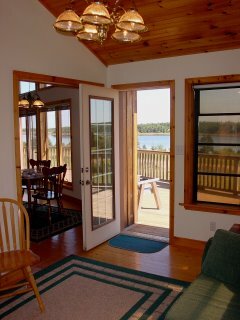 And don't forget those sand dunes beckoning you from the wrap-around front deck! All this plus premier golf courses, fine dining, museums, art studios, craft shops and all the attractions of Cavendish less than 5 minutes away. At Seascape Chalet, you have the best of all worlds -- tranquility deep in the heart of the Island's north shore. 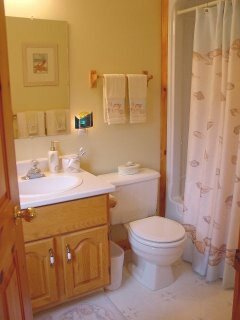 2BR/ 2Ba prow-front cedar chalet comfortably accommodates six. 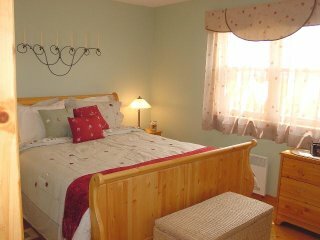 Especially suited for an unforgettable family vacation, a memorable romantic escape, or a relaxing "home away from home" to return to after challenging our reknowned golf courses by day, Seascape Chalet provides everything anyone could would want on a PEI summer vacation -- relaxing, luxurious and comfortable waterfront accommodation located on a tranquil peninsula only minutes from Cavendish on the PEI north shore. 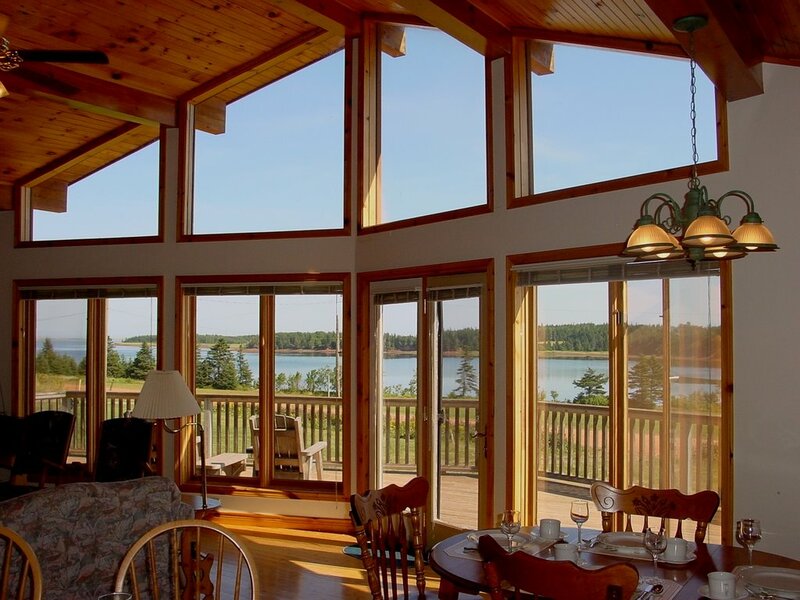 The spacious Great Room and adjoining sunroom provide for luxurious summer living, and the dining room and fully-equipped kitchen include everything you will need for a gourmet dinner of lobster or shellfish bought fresh from nearby Stanley Bridge wharf. 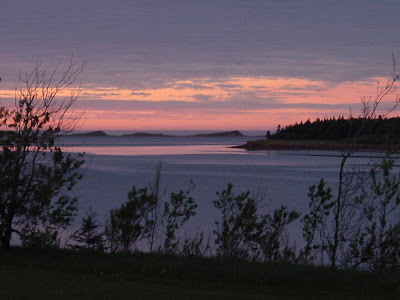 A propane fireplace with Island stone hearth provides romantic ambiance and plenty of warmth for those rare treasured mornings when the mist envelopes the lobster boats departing New London Bay. 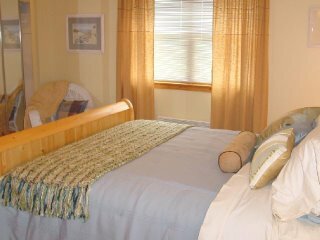 At Seascape Chalet, our aim is to provide all the amenities of home that you would expect -- plus some pleasant surprises. Thinking of a gourmet meal but lacking the inspiration? Browse our selection of Island recipe books for ideas. And what speaks to summer more than homemade ice cream? With the ice cream maker, everyone will be enjoying their own delectable soft-serve ice cream in no time! Seascape Chalet offers two luxuriously-appointed bedrooms, each with Queen sleigh bed, seating area and adjacent bath. Large double-sized closets and six-drawer dressers ensure more than enough room for all your belongings, and the quality bedding and themed décor provide an inviting and comfortable space for you to relax. The 'Seaside' room recalls sun, sand and endless sky. Decorated in tones of gold, beige and blue, this bedroom evokes a relaxing day at the beach. Wake up in the morning ready to hit the water – grab a beach towel from the closet, prepare a quick picnic lunch over breakfast, and you’re on your way! It is easy to appreciate but difficult to explain the captivating power of seashells. 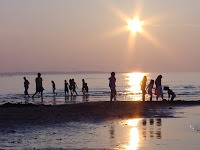 Young children will spend hours examining and sorting the variety of shells they will collect along the shore and at Cavendish beach. Parents will enjoy the space to relax that an entranced child provides. 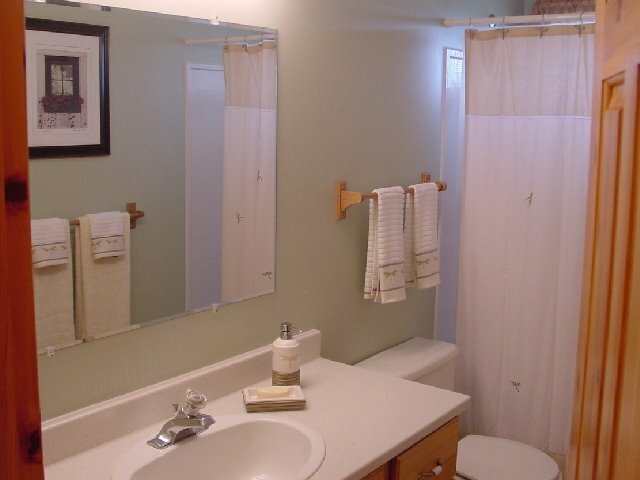 Anyone will appreciate the luxurious décor of the master bath, for nothing means beach, relaxation and fun more than seashells. Perhaps you will collect some shells yourself at the beach today! The "Meadow" room recalls a quiet stroll through a country meadow. Decorated in a light floral pattern in muted tones of green, red, gold and beige, this bedroom evokes the meadow flowers of a bright summer day, and delicate wrought-iron details remind one of a romantic English garden. 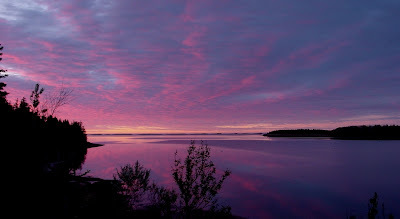 Aimless, timeless, a breath of fresh air. This is what summer is all about. Start your day with an invigorating shower in the natural décor of the “dragonfly” bath. 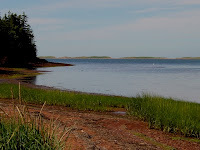 Delicate, entrancing and utterly free, dragonflies can often be found flittering around PEI streams and ponds in the summertime, and encountering one of these delightful creatures on your morning walk is sure to bring a smile to your face. What new memories will you create today? 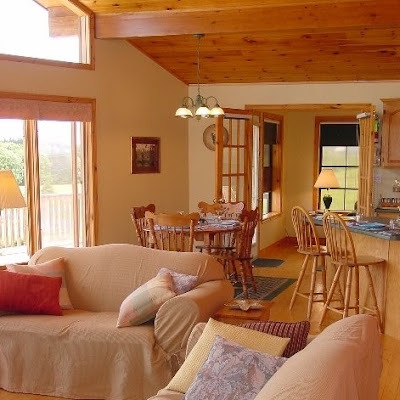 The sunroom is a perfect spot for relaxation. 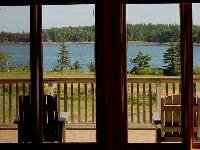 Curl up with a good book while soaking in the warmth and splendid water view of the protected lands of the PEI National Park and the dunes of Cavendish to the north. In the sunroom, you will find our extensive collection of books for both adults and children. A sofabed provides additional sleeping accommodations for two. Read what our Guests have to say! 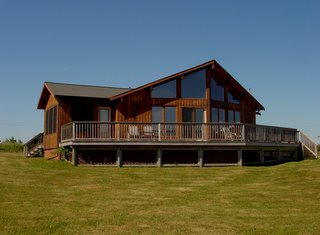 Luxury pei seaside accommodations. 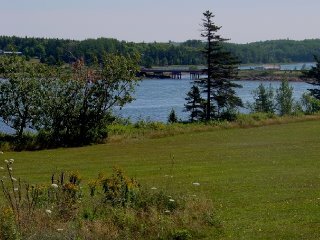 Tranquility and scenic views in the heart of the north shore. 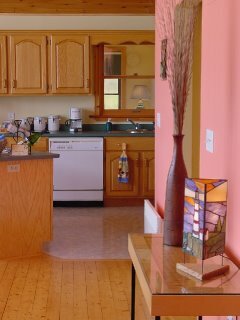 Seascape Chalet - a great place to stay!